April 15, 2019 April 15, 2019 by Vinay Leo R.
If I’m sharing about books I have loved reading, the list would be incomplete without a book from the Jack Reacher series of author Lee Child. I discovered the author’s works when I borrowed a book from my neighborhood library, and have since been hooked to it. The author releases a book every year, and I preorder his books more often than not. The bigger question was which book do I write about? 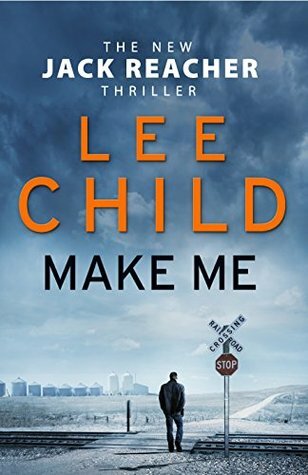 Make Me is the twentieth novel to feature the former military cop Jack Reacher. Reacher, who leads a nomadic lifestyle, is intrigued by the name of a small town and arrives there by train. At Mother’s Rest, he meets Chang, a Chinese American woman who is searching for her lost associate. She mistakes Reacher for that person. Rather than walk away from Chang, he opts to help her out. As he asks around town, he doesn’t realize that he’s opening Pandora’s boxes. But that’s who he is, and he’s as much trouble for those who want to take him out. The only way to tie loose ends is to solve the mystery of Mother’s Rest. The novel that preceded this one was quite off the mark. As an admirer of the author’s work, I had been disappointed with the book Personal. So this book had some expectations even before the read began. Suffice to say, the expectation was met, and how! Initially, as I read the book, I thought the story was about Keever, the missing associate. Reacher is known to help find missing people and help women who are in need. But the author springs a surprise by what the book is really about. He took the story to a realm I’d only heard of before, and left me quite awestruck. With two mysteries, that of the name and that of Keever, the book kept me engaged from start to finish. I think Chang and Reacher made a delightful match. The nomadic, reckless, cocky military cop is at his best in this novel, and Chang, who has a glass half full attitude makes a perfect fit for the jigsaw. The sub characters are also interesting and that helps push the story along too. Without a doubt, this is one of the best books in the series. If you have yet to read a novel in the series, I think I’d recommend going in order, as you can see the character of Reacher develop. But if you do read this, you won’t feel anything missing as most of the books in the series can be read as standalone novels too. This is the 10th year of the #AtoZChallenge and my tenth year attempting it. My theme this year is Books – Read and Loved. As evident by the theme, I am going to write on books I’ve read and loved. Liked this? Read some of my earlier posts written about Books.